Life has a seasonal flow to it - the Springtime of youth, the Summer of our 30s and 40s, the Autumn of midlife and the Winter of old age. Each Season has something special to offer and we would be foolish to try to rush through it thinking "if only...." Because the "if onlys......." stop us appreciating the many things that time of life has to offer us - times and experiences we will never have again. Stop and savour them while you can. Spring: If you are a young mum going slowly crazy from lack of sleep and living your life surrounded by small people and their mess, don't wish the time away. Don't dream of what it will be like when they are grown and flown and having time to do more than grab a shower and brush your hair. Don't think back to the early-Spring days before there were toys and children under foot. Instead, enjoy those baby snuggles, the unconditional love, the happy family photographs, the visits to the zoo or to the playground. Those times won't come again, those little people will grow and move out and you'll be proud of what you've achieved, but they'll never be babies again. Summer: If you have teenagers and they drive you crazy from eye rolling, curfew breaking, wrong person dating, fast driving, weird friend choices, strange outfit selections (the list goes on and on), don't wish them back to being babies again, or forward to being grown up and living away from home. Instead, enjoy the times when you get a spontaneous hug, or a surprisingly deep conversation. Celebrate the moments - first car, graduation, meeting their new boyfriend/girlfriend, seeing them make good choices - share their achievements because, before you know it, they'll leave the nest and you'll wonder where the time has gone. Autumn: Midlifers - (that's me) don't spend your time being sad that you've created strong independent children who have flown the nest and left you behind. Don't chase after them, let them find their wings and enjoy the independence they've earned. Instead, rediscover yourself - who are you now you're not absorbed in everyone else's life? Rediscover your partner - who is this person you've been married to for decades and what inspires you to stay together for decades to come? Enjoy your freedom from schedules and from the expenses those children brought with them. This is the time to tick off a few things on your bucket list - change jobs, or quit completely if you hate where you work, travel if you can afford it, try a new hobby, take up dancing.....the list goes on forever. Don't forget now's the time grandbabies start making an appearance and you get to experience the joys of parenthood without all the responsibilities (win/win!!) The Autumn of life can be such a wonderful stage if you let it. Winter: I haven't reached the Winter years yet, but I'm sure they will bring new adventures. No point in complaining about the ageing body, or the aches and pains and illnesses, instead you can use the years of retirement to invest in other people - babysit, visit friends, do some more travel, volunteer, get outside and enjoy the sunshine. Embrace this time of slowing down rather than resenting it. 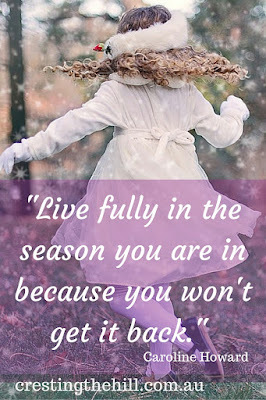 Every season has it's special times and Winter will have many too I'm sure. I feel like I could write about the Seasons of life for days and days - there are so many special moments in each season - moments we can miss if we aren't looking. 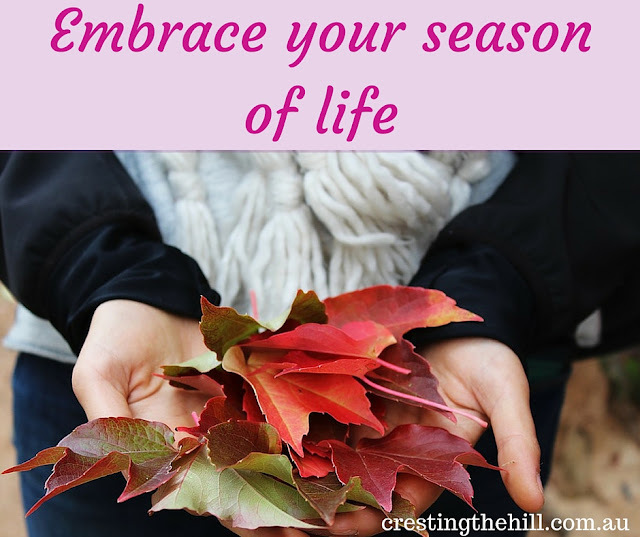 So, embrace your Season and let me know what you find special about it. Still trying to decide which was my favourite. They have all been delicious!!! 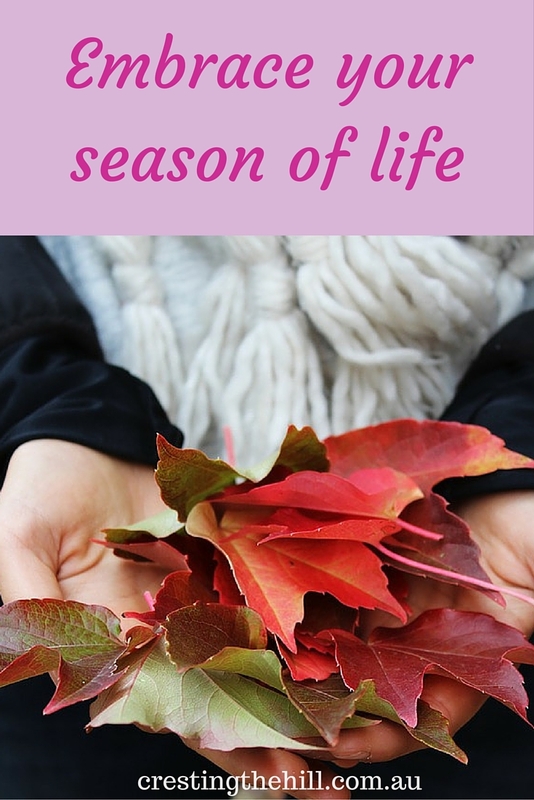 Being a new grandmother the seasons will each have their new memories. I love, love being grammie. What have you decided your name will be in this new role? I think I'm going to be Nan, Michelle. The other grandmother is Grandma, so it gives a bit of difference and feels about right for my age and stage :) Grandbabies are such a blessing! I'm extending my autumn for as long as possible but I'm sure winter will be just as good or better. I believe the saying used to be, "Be here now." There is splendor in Autumn. I like "be here now" Nancy and there is definitely a lot to be said for the beauty of Autumn! Hi Leanne! I agree with Rebecca I'm extending my autumn because I think these days our seasons of life are extending. My mother's generation was 'old' at 60 but we are certainly not feeling old or behaving old as we approach the winter of our lives. I'm really enjoying this series - it is a winner! I think I'm in the last month of summer, approaching autumn. One of my goals this year has been to enjoy each day, and stop worrying about the future. Great post! What a lovely way of stating the circle of life Leanne. We certainly are in the Autumn of life and are getting ready to take on new challenges and now that we are comfortable in our skin. We are aren't we Mary? Autumn seems to be all about settling into ourselves and slowing down a little and focusing on what it really important - getting off the hamster wheel! This is such smart advice. I think I did not enjoy my spring as I should have, and worked way too much in my summer. So far, I am doing my best in autumn. It has always been my favorite season. I hope to love this part of my life so much that I do not have regrets when it comes to winter! Nice one Leanne, it goes with Michele's last post on, What is important about today? Living today and being there appreciating all it has. Exactly Kathleen - it's such a waste of time looking back or looking forward, we need to be in the "now"
What a great reminder to stop and smell the roses. Life gets so crazy sometimes that we wish it was another time period all together. While we are wishing we are missing, and those times will never come again, will they? So true Nikki - I've wished away too many years of my life - now I focus on enjoying what I've got and changing something if it's making me unhappy.